Let me just take care of a few important things you should know before I tell you all about the amazing dinner we had at Spark. First off, they have a blog - just getting started mind you, but I am more than sure there is going to be a lot of great posts in the future so make sure you check it out. 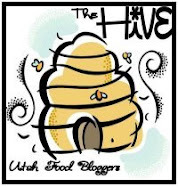 Another thing you should check out, especially if you are here in Utah or plan to visit Utah - they have a great website - and just reading the menu - which very smartly, will change seasonally - is completely drool worthy. If you are on Facebook and Twitter then you should click both of those links to become a fan and to follow Spark. The next, and perhaps right off the bat most important thing you should know is that Spark, in conjunction with treating a few lucky bloggers to their First Annual Bloggers Dinner, has given us the voucher you see below, to pass on to all of you, our readers - in particular anyone in Utah and especially in the Utah County Area (which, by the way, I'm in Davis County and this was SO worth the drive!). 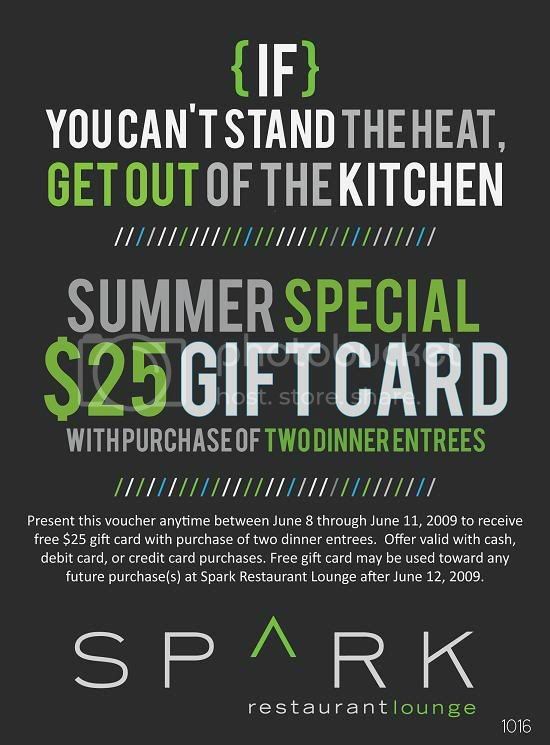 The voucher entitles you to a $25 gift card when you go to Sparks and purchase two entrees next week (June 8 through 11, 2009). You may be thinking, but what if I don't want to go back - and to that, all I can say is, trust me, you will! Seriously! Just do yourself a favor and print off that voucher right now, call Spark and make your reservation, if you've got kids - call the sitter, and GO! Spark Restaurant Lounge gladly accepts dinner and lunch reservations. and please let our staff know if you're celebrating a special occasion. Reservations are not taken for late-night nosh service, which is from 10 PM to close. please call the restaurant for special pricing consideration. So, why all the gushing? Could it be the great people? Was it great atmosphere? Was it the friendly and fun feeling of the place? Was it the menu? The drinks? The food? The desserts? Finding some place so unique? How about finding some place that is obviously so well thought out with care, intelligence and imagination? The event itself was an 8-course tasting menu which included some items which haven't even been on their menu yet. It also included any of their custom house made refreshments. Since I am a picky eater I committed myself at the beginning of the adventure to try everything. I have found over the years that most of the foods I thought I didn't like, I just didn't like the way they were prepared. My sister-in-law went to the dinner with me and we were able to sit at a table with Quinn of Limelight Food Photography, and her husband, Randy. What a great and fun couple! We had a great time with them! 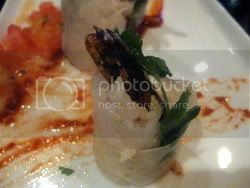 The shrimp roll had jicama, cilantro, sushi rice, tomato jalapeno salsa and guajillo puree. We all really loved this one - it was amazing, and one of the items that they hadn't put on the menu yet, but I'm sure they have now, or will soon. The Cheese & Meat Assortment had manchego, chevre, beehive smoked promontory cheddar with apples and walnuts, criminelli salamis, cacciatore, sopresatta, casalingo, and quince paste. To be honest, I didn't know what to do with all of this, but it was really fun to eat. The surprise for me here was the different salamis, which I always thought I didn't like, and found that I really enjoyed a lot. 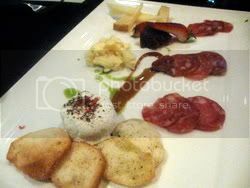 My favorite cheese on the platter was by far the chevre - which I am still craving more of! 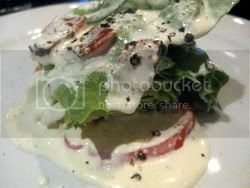 Boston Bibb lettuce, heirloom tomatoes, cherry heartwood smoked bacon, and blue cheese dressing. I am really not much of a salad eater, but I really liked this. The blue cheese flavor in the dressing wasn't too pronounced for me, but was nice and creamy. Oh, the drinks. I rarely order anything but water in restaurants, because it just isn't worth it to me. The only time that changes is when there are really well made, wonderfully crafted refreshments like these. I really loved the strawberry lemonade, it wasn't too sweet or too tart, but just a perfect balance - and just look at that fun presentation! 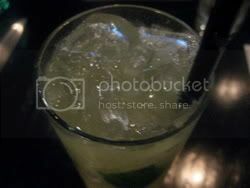 The Mango Mojito, which was a mix of mango, mint, lime and seltzer water was also a perfect balance for me. I am not a big fan of carbination, but this had just a nice little fizz to it and the flavor was really refreshing. 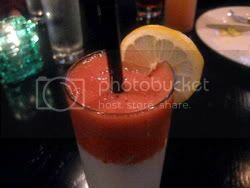 I also tried a Bellini of white peach puree and seltzer water - it had an intensely peach flavor and was really delicious, but I didn't get a picture of it - sorry! 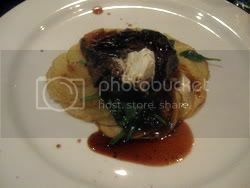 The Pan-Roasted Filet Mignon was served with potato galettes, roquefort, a red wine demi-glace, and sauteed spinach. This dish seemed like a shoe in to be my favorite of the night, but while the filet itself was cooked perfectly and was absolutely heavenly, none of us really cared for the roquefort flavor that came through in the potatoes. I probably was the one that liked that the least. The thing is, I just am not a big fan of any blue cheeses, so if you like that, then you would probably love the potatoes. The potatoes themselves were made really nicely, I just didn't care for that flavor. 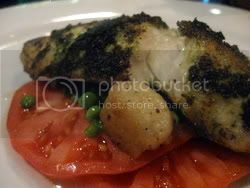 The real shocker of the night, for picky me anyway (I know I will get grief for admitting this, but I am really not a big seafood fan - at all) was the Basil Crusted Wild Alaskan Halibut. Oh baby. When they brought it out, I thought, well, I'll try a bite at least. Let me just tell you, I ate the entire thing and was sad when it was all gone. It was incredible! I can count on one hand the number of times I have really enjoyed seafood and this one rockets right to the top of the charts! It was served with parmesan gnocchi (which was really, really good - I could have eaten more of those as well! ), more heirloom tomatoes, some sweet peas and tomato consomme. I am not much of a tomato fan, and I did try them with the salad, but I passed on them this time. I would have loved more of the peas though because they were really good. 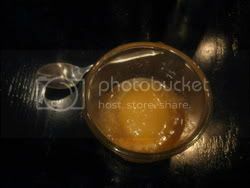 We were given the Mango Sorbet to 'cleanse the palate' before the desserts were served. It was really good, but really a bit too strong for me. I was the only one at the table that didn't fully love it though. 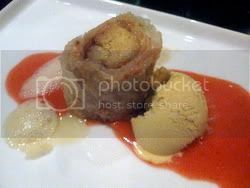 The banana strudel was served with a house-made mango ice cream, strawberry coulis, and a mango coconut foam. The banana was sweet and warm still and the dessert was my favorite of the two. I really enjoyed it and was surprised since it wasn't something I would have ever thought to put together for some reason. The Panna Cotta was made with vanilla and what they called kiwi pearls - which were tapioca pearls that were 'soaked' in a kiwi solution of some kind. 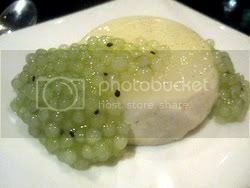 I really liked the panna cotta, and I liked the tapioca pearls. They worked well together, but I am not much of a tapioca fan, so this one wasn't my favorite. Others at our table really loved it though, so again, probably just me. Spark is like no other place in Utah (or anywhere near Utah) that I know of. 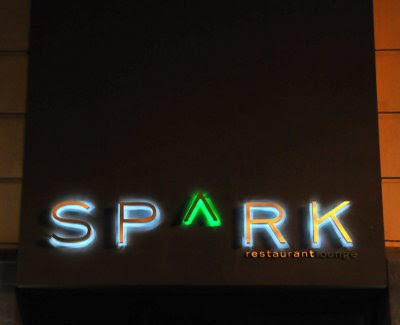 Spark Restaurant Lounge is a full-service restaurant that specializes in New American cuisine. Executive Chef Lauro Romero uses fresh local and exotic ingredients with a variety of ethnic techniques and influences to offer guests unique dining experiences on each visit. Spark's completely non-alcoholic full-service bar serves innovative mixed drinks and unique bottled sodas. Spark does not serve any alcoholic beverages. Spark is open for lunch, dinner, and late-night nosh. Lauro Romero was born in Tulancingo, Mexico and came to the states at the age of 14. While working his first restaurant job as a dishwasher at Fuggles of Salt Lake City, his passion for food developed. He gradually worked his way up in the kitchens at various restaurants in Salt Lake. His career progressed as he assumed management roles at both Mikado and Ichiban of Salt Lake City. He joins Spark Restaurant Lounge from award-winning Bambara where he worked as Sous Chef to critically-acclaimed Chef Dave Jones. Born and raised in Payson, UT, Blake Ballard graduated from BYU in 2007 with a degree in Accounting. Immediately after graduating he moved to San Jose, California to work as a financial analyst. He quickly realized that finance was not for him. While contemplating his next move, Ballard was intrigued with the food and social scene that dominated the area. He compared the area to Provo and found two major differences: Provo was saturated with franchise-based restaurants and Provo had yet to fill a niche for metropolitan-style nightlife. Seeing those two voids, the concept for Spark was born. Why don’t you serve any alcohol? At Spark we focus on providing both great dining and social experiences to our guests. In regards to fine cuisine, we understand that for many fine food lovers alcoholic beverages are part of the dining experience. At the same time, we recognize a large local demographic seeking an upscale and non-alcoholic setting for dining and nightlife. In an effort to provide both incredible food and an ambiance which appeals to the majority of our guests, we have chosen to not serve alcohol. When carefully crafting our beverages we use the best seasonal ingredients available. However, we do not presume that our drinks are to be “paired” with our dishes like a wine would be. Our drinks are intended to give our guests unique beverage options and are meant to draw contrast to typical nonalcoholic alternatives rather than to draw comparison to alcoholic ones. We have no current plans to add alcoholic beverages to our menu. Why does your menu have fewer options than most restaurants? The dishes that Chef Romero creates draw on the freshest local and seasonal ingredients. Food always tastes better when the ingredients are in season. That means that our menu changes often and with the seasons. If you come to Spark after somewhat of a hiatus don’t be surprised to see a completely different menu! Guests can also look forward to unique dinner specials on the weekends that often include seafood freshly flown in from across the world. Our daily three course lunch special ($10) also give our guests new and flavorful options each time they dine with us. What goes on in the lounge? As mentioned, at Spark Restaurant Lounge we believe that eating out is just as much social as culinary. While guests often request to dine in the lounge during lunch and dinner, the lounge becomes the busiest after 10 PM when groups of friends and couples come in for drinks and late-night nosh. The lounge gives our guests a nightlife dining alternative to drive-thru chains and 24 hour diners and often includes live music from local and out-of-state artists. The lounge is also often reserved for wedding receptions and private parties that include chef-customized hors d'oeuvres and of course, our signature nonalcoholic drinks. Sad I missed this dinner, I was bummed when I got the email and knew we would be in Florida. I am glad you liked it! I hope to still go in soon! Holly, I live up North too, but am tempted to make the drive to P-rovo as we call it, to try Spark. Thanks for the great informative review! It appears that you have the same values and standards as me. You had me at the first recipe, but now I am really impressed! That is amazing that Spark is so hip and cool and yet does not serve alcohol. That is so awesome. I hope they are forever successful because of that. 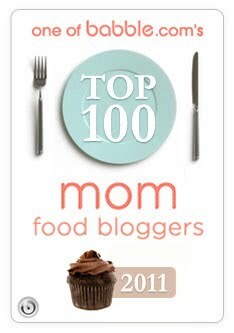 I know your blog is pretty fancy, and mine is not, but I sure would appreciate it if you would add me to your blog list. Would you mind adding me? Thanks you so much for your consideration. I would be flattered. Wow~ I am drooling! I believe I would love everything and eat every last bite! Great review, Holly! Thank you so much for adding me! Have a great weekend! I am so excited that Utah County is finally getting some good restaurants! Now I just need to eat out more often - I think I'll be taking my husband on a date next week!